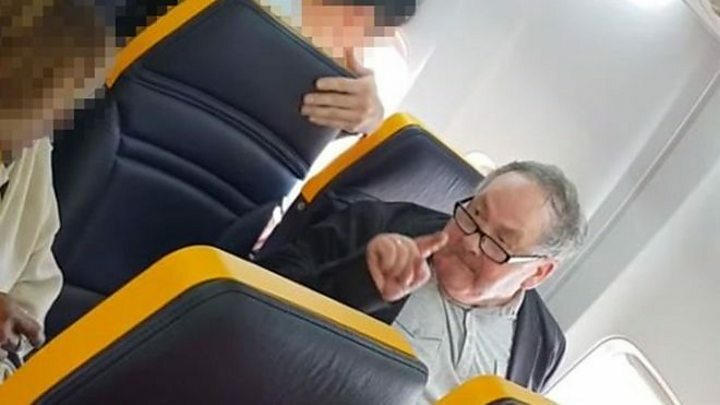 Ryanair said it "will not tolerate unruly behaviour like this". After a flight attendant intervenes, the woman says she wants to sit with her daughter and tells the man he "stinks". She says of the passenger: "Kick him out". David Lawrence, who filmed what happened, told BBC Radio 5 Live: "Everything was calm, we were getting ready to take off. And then a man came on board and arrived at his seat, then spoke very harshly to a woman sitting in the aisle seat. Image caption Ryanair said it "would be taking the matter further"
Mr Lawrence said no attendants initially came over. The woman's daughter, who had been sitting elsewhere, arrived and "an argument started", he said. "He pushed past the woman and went to his seat," he said, adding that what's seen in the video then unfolded - describing it as the "most disgusting exchange of racial slurs and foul language". The woman's daughter said she had taken her mother, a Windrush Generation migrant who came to the UK from Jamaica in the 1960s, on holiday to mark a year since the death of her husband. She told The Huffington Post: "I know that if I was behaving like he was - or any other black person for that matter - police would have been called and we would have been kicked off the flight." She added: "Mum's really feeling upset and very stressed about this situation, on top of the grief she's already experiencing. As for me, I'm upset about the whole thing too - the fact that the passenger wasn't taken off the plane and how the situation was dealt with." A Ryanair attendant says to the man: "Don't be so rude, you have to calm down." He then tells the older man he is going to refer the incident to his supervisor, to which the man replies: "I'm alright." "I am so shocked," Mr Lawrence said. "There was no response [from most other passengers]. No-one said anything. The young man who actually intervened... he was compelled to step forward." Mr Lawrence said it was a "horrible, horrible situation" and that he was "shocked" that Ryanair "allowed something like this just to go unchecked". He also said "he should have been removed from the flight and handed over to the police". Ryanair told the BBC: "We operate strict guidelines for disruptive passengers and we will not tolerate unruly behaviour like this. Essex Police said on Sunday: "This incident, which we were made aware of this morning, is believed to have taken place on a plane at Barcelona Airport. "Essex Police takes prejudice-based crime seriously and we want all incidents to be reported. We are working closely with Ryanair and the Spanish authorities on the investigation." The Department for Transport said "everyone should be able to enjoy a safe and calm journey without their flight being spoilt by a disruptive minority". The DfT said it would work with airlines and airports "to look at what more can be done to deal with disruptive passengers".